Effective Fall 2017, up to five students will be eligible to receive a one-time $3,000 scholarship award for fulltime attendance at the UAS Juneau Campus. Eligible recipients will be current seniors from Juneau Douglas High School, Thunder Mountain High School, Yaakoosge Daakahidi High School, Mt Edgecumbe High School, and any other graduating senior from a Southeast Alaska high school, to include graduates of home school programs. One scholarship is available at each school. This award will be available to high school seniors who show promise as an incoming UAS student but have had to overcome challenges and/or hardships in their high school career. The students may or may not have the highest grade point average or test scores, but they are recognized for their talent, fortitude, and motivation to succeed. UAS Financial Aid will notify students of their award. 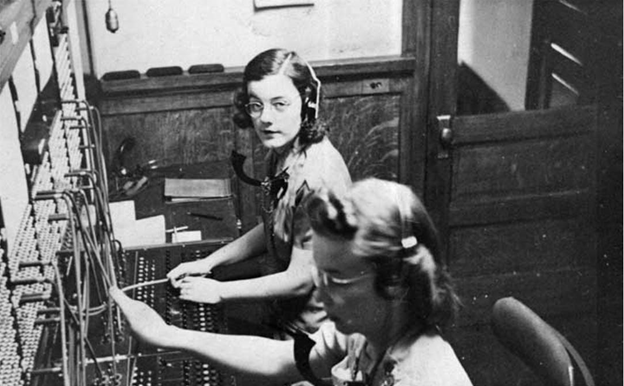 Verna Carrigan (pictured at telephone switch board in 1939) was born September 19, 1914, in Juneau, Alaska. She was the second of three children of parents, Robert Cornelius Hurley and Minnie Scott Hurley but lost her father to an untimely death at a young age. During these childhood years, hardships were looked upon as a common occurrence, and the strength and work ethics of her mother and grandmother held the family together with a bond that would endure through the years ahead, and formed the foundation of Verna's character. Verna's family owned Juneau and Douglas Telephone Company, the first phone company in Juneau. As a teen Verna worked at the Zynda Hotel (later became the Juneau Hotel) and the Baranof Hotel, filling various positions from desk clerk to head switchboard operator. Verna's place was at the switchboard, connecting calls manually by cord and plug. It was a key position in the system, and during times of storms or a major fire, the operators were the hinge of all communications. They held their posts at all costs, making sure the calls got through, disregarding meals or personal matters. In time, she was the Chief Operator and Company Vice-President.